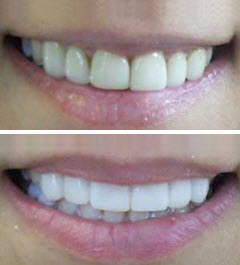 Amazingly white teeth in just 1 hour! Nothing gets your teeth whiter, faster. Now virtually everyone can have beautiful white teeth safely, effectively and conveniently. Introducing the ZOOM! In-Office Whitening System, the revolutionary tooth whitening procedure. It’s safe, effective and fast, very fast. In just over one hour, your teeth will be dramatically whiter. ZOOM! Whitening is ideal for anyone looking for immediate results. The convenience of ZOOM! in comparison to days of wearing trays and gradual teeth whitening makes it the perfect choice for the busy individual. The ZOOM! Whitening procedure is simple. It begins with a short preparation to isolate your lips and gums. ZOOM! Whitening Gel is activated by a specially designed light. Teeth typically become ten shades whiter, sometimes more. A five-minute fluoride treatment completes the procedure. You’ll be amazed with the results. In most cases, teeth get even whiter the first few days after the procedure. Expected results: 3 years. With regular cleanings, your whiter smile can sparkle for years. Oxygen from the revolutionary gel is used to bleach out years of stains in one hour. Studies show that people with white teeth make a better first impression! The full ZOOM! procedure costs only $597. In addition to that great value, you receive free customized whitening trays and free bleach gel that you can take home and touch up when you desire. That can add up to a lifetime of bright, white smiles! To have whiter teeth in about an hour, call Philly Dentistry today! 215-568-6222.